Although one of our busiest and emotional days, it started like most other CWB coaching days…with hundreds of children all running slightly behind GMT. But once it got up and running and everyone found their coaching rhythm, the morning was a huge success with over 300 children coached from 4 schools. Our first inspirational Isaac of the day was a teacher from Family Spirit Orphanage. Despite being a bit timid in the coach ed session the day before, he quickly found his feet at my bowling station and became the titular leader of the other bowling coaches that morning, setting a tremendous example to all his fellow teachers through his enthusiasm. Our second Isaac of the day was also present at the morning’s cricket, but his talents weren’t fully appreciated until we visited him at Family Spirit Orphanage that afternoon. Long time friend of CWB, Alpha Adowa, who volunteers at the orphanage for a week every month, organised our visit and introduced us. It was the closest to a rockstar experience we’ve had so far, with scores of children meeting us off the bus and shouting our names that they had remembered from the morning”s session. After the fanfare, where many balloons were cyclically blown up, handed out, and popped, we sat down to experience the children’s traditional African welcome dance. This is where nine year old Isaac really showed us how precocious he is on the drums, not to mention how precocious he was on the cricket field that morning too. Although said too often, it truly is an experience you had to be there to appreciate. Blog form really can’t do justice to the talent, coordination, and dedication of these children, especially given their background. Hopefully the pictures can help a tad. For me, the most touching experience came from Isaac number three, Founder Isaac, who set up Family Spirit Orphanage over 15 years ago. He showed us around the Orphanage’s growing agriculture set up and explained their admirable plans for self sufficiency. The Orphanage has both livestock and arable setups, with everything from avocados to goats being farmed for and with the help of the children. On the walk back from the farm, along some very dusty Ugandan roads, Isaac told us the backstory of the orphanage. After first testing HIV positive in 1995, and consequently losing his job, he decided to spend what little time he thought he had left educating children in rural Uganda about HIV/AIDS. Family spirit was set up in 2002 with just 18 children. In 2017, Isaac still lives there with over 300 children, including two of his own, who are both HIV negative despite their parents’ status thanks to the growing availability of anti-retroviral treatment. 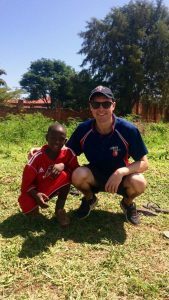 Even more impressively, the Orphanage has under 40 HIV positive children, which although still too many, is at a rate significantly below the Ugandan average. Isaac then explained to us the lengths the orphanage goes to to break down stigma of all kinds: whether it be the HIV positive children always taking their medicine like all others with and in front of their peers, or whether it be the blind weaving teacher – or whether it even be the plans to hire a sign language teacher so the deaf children can communicate properly with all of their peers. Heartwarmingly, Isaac sent his gratitude to CWB, explaining how initiatives like this are often the only chance the children get to leave the orphanage walls for weeks on end. Notable mentions should also got to Alpha, as well as teachers Ritah (mentioned yesterday), Michael, and Mable, who all do tremendous work at Family Spirit and have formed some truly fantastic relationships with their students. Please visit the Family Spirit Facebook page as well if you could spare the time (add link). Isaac (the author in this case! ), I know I speak for all at FCC in saying how impressed & proud we are for all you’re doing out there. Enjoy your last few days and look forward to seeing you at the crease in a few weeks time.